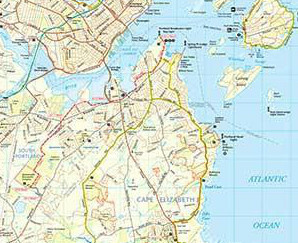 The city of South Portland broke off from it's neighbor, Cape Elizabeth and was founded in 1895. It is a very diverse city with a population of just over 25,000 people and encompasses just over 14 square miles of land. South Portland overlooks Portland's waterfront and is separated by Portland Harbor. In many neighborhoods, you can hear the bell buoys ring as the tide moves in and out and at night you can see the glory of the Portland skyline. There are many different neighborhoods in South Portland and they all have their own unique style and flavor. Ferry Village has an eclectic variety of homes, while Sylvan Sites has unique homes that are different from the rest of the city and often take a European twist. Country Gardens is very convenient to the Maine Mall and I-295, while Willard Beach and Meeting House Hill are located at the most Eastern part of the city. They offer Willard Beach, Southern Maine Community College, Bug Light Park and a number of different restaurants and hops. Knightville boasts Mill Creek Park, shops, supermarkets, City hall, the US Post Office and a Marina. Many neighborhoods have quick access to the Green Belt Trail which is a paved walking, running or biking trail that connects from Bug Light Park through town to the Wainwright Athletic Fields. Mill Creek Park is often the center for many activities throughout the year. Art in the Park in August, summer concert series, Tree Lighting on the first Friday in December, ice skating in the winter and leisure time throughout the year. The Farmers Market is a weekly event held just outside Mill Creek during the Spring and Fall. The airport and train station are only a 10 minute drive from anywhere in the city and the South Portland Bus Service runs all year long. There are two movie theaters in South Portland and if you are thinking about living in South Portland, don't forget to check out the Memorial Day and Veteran's Day Parades. On the 4th of July, the Portland Fireworks can be see best at Bug Light or along the waterfront. If you are active outside, South Portland is a great place to run, walk, ride or roll. You can get to other beaches within 10 minutes, head to Portland Head Lighthouse in 5 minutes, Old Orchard Beach within 20 minutes, skiing at Shawnee Peak in Bridgton in just over an hour or head to Boston for the day in just under 2 hours. Courtesy of Downeast Realty, Inc.